The timing was finally right. Though it wasn’t what he’d expected, he just couldn’t wait any longer. With shaking hands, he opened the drawer of his nightstand and pulled out a small square box. They were at home, in the most relaxed environment with no one else around, though everywhere they go together feels like home… He got down on one knee as his heart pounded in his chest, and her eyes grew wide in surprise. “Meghan…Lawson” he started, as the nerves took over and he couldn’t remember her middle name. But it didn’t matter. It was perfect, and it was their own slice of Heaven as she excitedly said yes to being his wife. It’s a moment they will never forget, and one that began the nest chapter in their romantic love story! 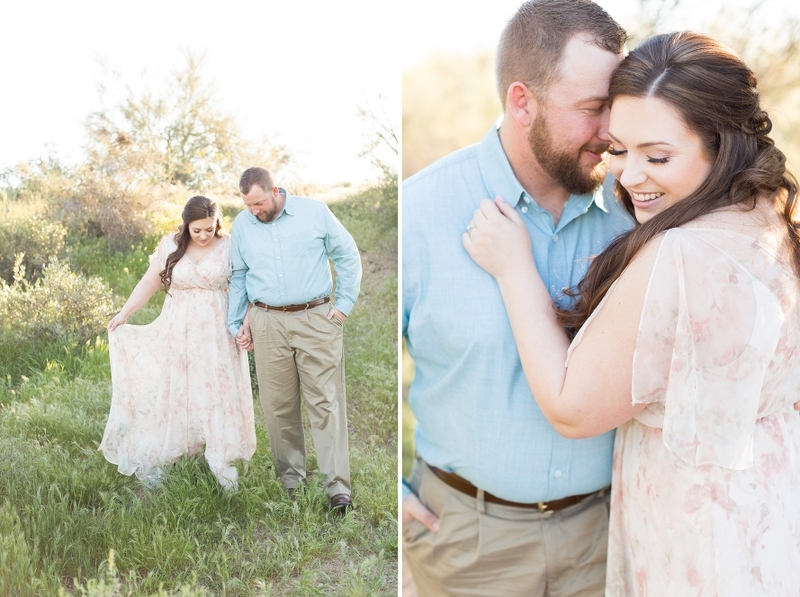 Meghan and Erik are simple my people, so incredibly sweet and so immensely in love that it makes my heart flutter when I think of their glowing engagement session. Not to mention they love Sauce, which happens to be one of my favorite restaurants (for the best price! ), and it was originally where Erik planned on proposing because that’s where they had their first date! But when the night came, it was busy, and it just didn’t feel right, so he waited until they got home. It was such a good call and made their story even sweeter! 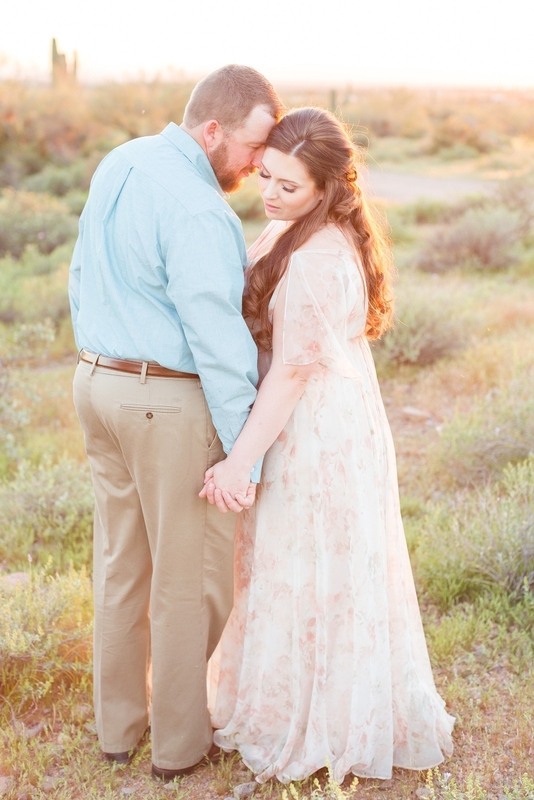 And their engagement session was just MAGIC, friends! 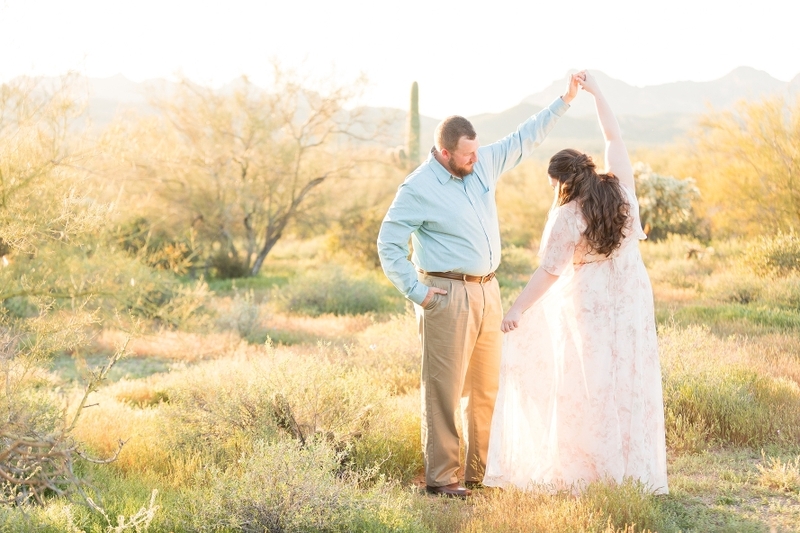 Her flowing Jenny Yoo floral dress paired with his soft blue button up complimented the golden desert absolutely perfectly! And her softly braided curls and stunning green eyes just made my job so easy and beautiful! And as stunning as these two are alone, together they create every photographer’s dream in front of the camera (especially the “Erik Face”)! I’m so incredibly blessed to be a part of this journey with these two, and I can’t wait to see what their future holds, all five of their animals included. Congratulations Meghan and Erik, here’s to many more dazzling moments to come!